During one of my last visits to Sallys's I picked up a box of Ineral L'oreal Hair Fixer. I've never even heard of the product before but I am a sucker for any hair product showing a picture of a damaged hair strand repaired after using it. I kept the hair fixer locked away in my hair product closet (yes I said closet) until today's wash. My intentions are to chronicle the results I experience from consistenly using this product once a week for the next six weeks. I began my routine as I usually do by pre-pooing with Tigi Dumb Blonde conditioner and Alma oil. I bought Tigi years ago because I thought it would be a super potent conditioner for chemically treated hair. I was not impressed with Dumb Blonde for deep conditioning but it turned out to be an absolutely fabulous for my prepoo treatment. I may actually repurchase for this reason. Anywhoo, after washing in the shower, I proceeded to mix a variety of conditioners together in a small bowl in preparation for my deep conditioning. It was then that I decided to read the Hair Fixer instructions to verify if the product should be used before or after the conditioner. Much to my surprise, the instructions state that conditioners should NOT be used when using the fixer (apparently using a conditioner may coat the hair and limit the ability of the product to penetrate the hair shaft). We're even discouraged from using conditioning shampoos. I thought long and hard about whether I should even use the Hair Fixer this go around. My conditioner mix was ready for use and I could not get myself to just throw it away. I decided to be a bad girl and use the conditioner even though I had been forbidden to do so. Twenty five minutes later I proceed to compile the ingredients from the kit. The box consisted of six tablets, one for each application,an applicator bottle, and a bottle of clear solution. As directed, I placed one of the tablets in the applicator bottle and poured the liquid solution over the tablet to the fill line. Once filled, I shook the contents for several seconds until the tablet dissolved. 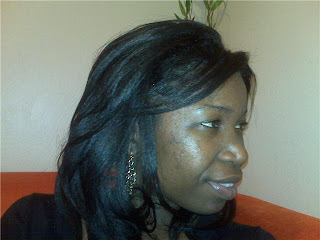 After preparing my hair repair brew, I began to apply the mix to my hair in sections until I'd used the entire portion. After setting and drying, I assessed the state of my hair to see if the hair fixer made any difference. Let me tell you folks, so far I am really liking what I experienced. Usually, after removing my rollers, I experience mild breakage as I loosen my curls. Today I can honestly say that my breakage was definitely minimized. My hair feels much stronger even though I didn't fully follow the instructions. I did a quick search online for reviews and most people have experienced great results. I'll update you all with my progress after each of my six applications. Next use, I'll bite the bullet and (gasp) skip out on the conditioner to see if it makes any positive difference. According to some info I found online, the hair is supposed to improve progressively with each application. If this product delivers on its promise, its definately worth its weight in gold. I paid around $8.50 at Sally's so it comes out to around $1.42 per application. Not bad for what it claims to do for the hair. BTW, the product can be used on damaged, thin, or normal hair. For those of you interested, here's the full description of the product. Enhanced formula with added restructuring molecules and amino acid complex gives hair intensified repair and enhanced protection to the hair fibers. Provides greater strength and resistance to external aggressions. Hair is more manageable, softer, smoother and shinier. The Hair Fixer rebuilds and restructures damaged hair. Each application penetrates the cortex and actually restructures the hair fiber with large, strong molecular bonds. This forms an inner network of strong new bonds that reinforce weakened linkages. The more damaged the hair, the deeper the Hair Fixer penetrates. The Hair Fixer strengthens and conditions chemically processed hair. Any chemical or coloring process alters the structure of the hair. The Hair Fixer contains amino acids that help to reinforce and protect the hair, so it maintains its strength and elasticity through any chemical process. It works instantly and remains in the hair; each application adding to the good work of the previous one. So hair becomes stronger... with shine, manageability and a naturally beautiful appearance. The Hair Fixer builds volume on thin hair and helps thin hair stay strong as possible and look as thick as possible. You can actually see and feel the hairs full, firm finish. Hair has more body and volume... it looks thicker and fuller. The Hair Fixer is easy to use and is not rinsed out, so the substantive benfits stay in the hair for maximum effectiveness. There is no greasy or sticky feel. One formula suits all your clients needs. Lotion: Water, Dimethylol Ethylene Thiourea, VP/VA Copolymer, Polyquaternium 4, Amodimethicone, Microcrystalline Cellulose, Monosodium Citrate, Polyquaternium 11, Hydroxypropyltrimonium Hydrolyzed Wheat Protein, Hydroxyethyl Oleyl Dimonium Chloride, Magnesium Acetate, Zea Mays (Corn) Starch, Sodium Sulfate, Trideceth 12, Aspartic Acid, Sodium Chloride, Stearic Acid, Cetrimonium Chloride, Simethicone, Green 5, Alcohol Denat., FIL (D3333/1). Tablets: Corn Starch, D&C Green 5, Dimethyol Ethylene Thiourea, Microcrystalline Cellulose, Sodium Sulfite, Stearic Acid. Hmmmm, you've piqued my interest. Keep us posted! see my blog for details! No different to any other reconstructor - just better marketing that's all. I have used the Hair-Fixer for more than 20 years. I looked for it at Sally Beauty Supply last week and called a couple of Long Island (NY) locations today. They told me they don't carry it anymore. I am from Louisiana and the Hair-Fixer kept my hair from frizzing there. I does reduce breakage. My hair is at my waist--a combination of the hair-fixer; Life-Force vitamins; and spot perming and dying--I do not use perm except on new growth and I mix just enough dye to cover the gray at my temples and crown. Without the Hair-Fixer, Sally may lose a customer.